Come and spend the night at the Yanchep Inn in Western Australia. We have New Lakeside motel rooms some with spa baths, original motel rooms and our historic style hotel accommodation. The Yanchep Inn has older style hotel facilities with communal bathrooms. The rooms are adequate and comfortable, the quaintness and ambience of the historical Inn that is perfect for a holiday. The Inn rooms are described as “Back packer” style. No fuss but clean with linen provided. 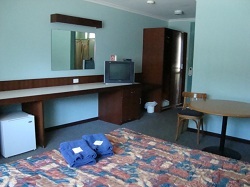 The original motel units to the south of the Yanchep Inn are a comfortable place to have a break. 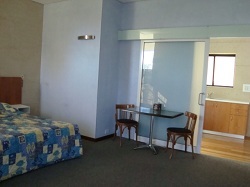 The rooms have a combination of Queen size and Single beds, are air-conditioned and contain a television, bar fridge and ensuite. Tea and coffee facilities are provided along with a toaster. The Lakeview rooms are the newest addition to our accommodation. All rooms contain King Size beds, are air-conditioned, contain a television, bar fridge and large bathrooms. The Ensuites are fitted with a walk in Shower in the Standards or a Bath with Spa jets in our Superior & Deluxe rooms. All Lakeview rooms have either a Balcony or Veranda overlooking the Kangaroos and Loch McNess. The Midweek prices are Inclusive of the Accommodation for 2 adults only. Note: If you require breakfast Mid-Week, this package applies, however your cooked breakfast will be cooked to order. This package incorporates everything in the Saturday package with the Addition of Dinner for 2 in our restaurant. Guests can choose either 2 entrees and 2 mains OR 2 mains and 2 desserts from our a la carte menu. The Ultimate package at the Yanchep Inn. This includes everything in the Dinner, Bed and Breakfast and adds a bottle of Sparkling Wine in your room on arrival and either a Bottle of Red or White wine with your dinner.